Tacos from the Kung Fu Taco Truck in San Francisco. I’ve mostly stayed away from the food truck trend, not because I haven’t wanted to sample what’s out there, but because I’m usually not in the right place at the right time. Or so I thought. A little bit of research and word of mouth revealed that there are actually a few food trucks making the rounds in San Francisco’s Financial District, like the now-popular Kung Fu Tacos truck. Posted at the corner of Sacramento and Montgomery, the Kung Fu Tacos truck serves fusion fare for lunch Tuesday through Friday. I tend to approach fusion fare apprehensively, but I was pleasantly surprised here, even if the portions are smaller than average. 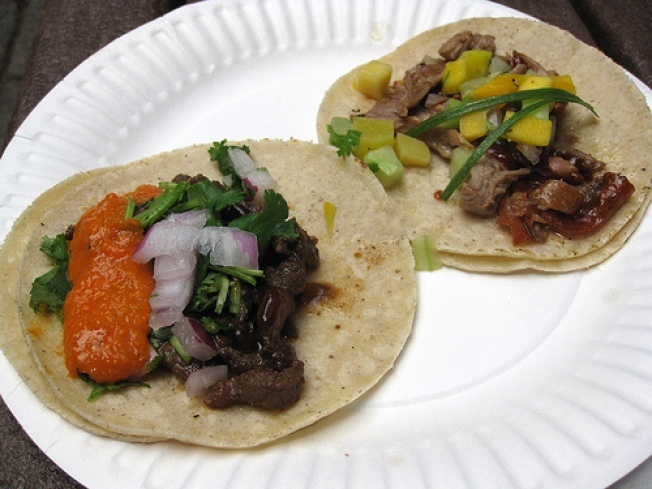 I tried the roast duck and Asian asada tacos on my visit: Asian asada is marinated steak topped with onions, cilantro, and spicy Asian-style salsa, while the roast duck tacos are garnished with mango salsa, hoisin sauce, and green onions. Both were tasty, but the duck was my favorite. Faintly reminiscent of roast duck with Mandarin pancakes, the rich meat contrasted well with the piquant mangoes. The steak was good too, even if it included almost as much onions as it did steak. If you’re going for lunch, I recommend ordering more than the two tacos that I did, as I was still hungry afterward. These aren’t as filling as your standard taqueira tacos, but they’re a welcome change from the countless sandwich shops that line the Financial District. Plus, at $2 to $3 each, the price can’t be beat and for a busy workday lunch, neither can the location.